MagicISO for Windows 7 - the creator of disk images. The application works with both physical media (CD, DVD) and with the hard drive. You can create bootable discs, edit their contents. It supports many image formats, integration with the interface of the conductor. The software has high power and versatility. The user interface is intuitive. For beginners, there is support for detailed illustrative explanations. If you are afraid of losing important data, then create backups using this software. 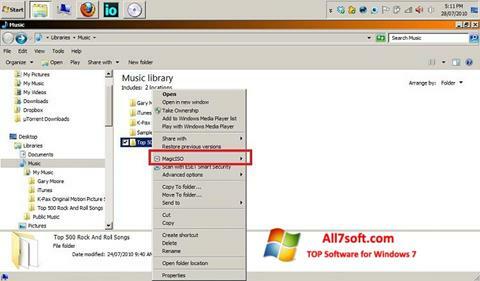 You can free download MagicISO official latest version for Windows 7 in English.